Another trait they share is that they stop at nothing to gain their goals. 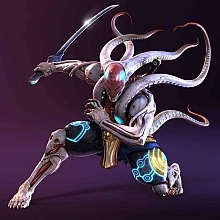 Yoshimitsu would smash himself through concrete walls to gain what he wants. Bryan would, too, with the difference that he may grab the nearest person and smash him/her through the wall if needbe. Yoshimitsu indeed lends a helping hand to others whereas Bryan doesn't, unless he gains advantage of the situation. Yoshimitsu has his code of honor and Bryan hasn't. But when speaking of such things, one must remember that they come from two different cultures. Yoshimitsu may have lived his whole life in a ninja village, whereas Bryan comes from the NYC slum area (judging from his dialect, that is. I may be wrong.). Yoshimitsu was taught the code when he was a kid. When Bryan was a kid and was told about "code of honor", he might have asked; "What's that? Can I eat it?" I apologize if my point of view has disturbed someone, but I'm not changing The Blood Ring's storyline to please anyone but myself, no matter how selfish it might sound. I'm forcing no one to read it, anyway. And I declare it R-rated as well, just to keep my miserable hide safe from the parental advisory bullsh*t.
Oh, and do not think I completely side up with Fury. See my avatar? That's a common joke in Finland. When someone has a stupid expression on his face, it is usually said that "even he/she is interested", even though it means the complete opposite. Who said I'm going to force you to change the storyline ^^. I'm just defending my point of view. Tenshimitsu : ...Bryan isn't "alive": he's a cyborg. He was made out of true Bryan's corpse. They're not the same just because they were mechanized by different scientists. :p Anyway, I don't really care that much, I think you get me wrong. Don't get nervous. We have our point of view and it seems we won't change it, and that's all. A minor update. Sorry for the sh*tty quality, I don't own a scanner so I had to use my bro's digital camera. Very nice! I am curious about Yoshi's father, hehe. Who was his mother, then? Interesting, can't wait for next parts. Uploaded another character sheet, presenting yojimbo Hebime. Don't know if he'll ever appear in the comic, though... look at him and you'll certainly know why. It was just another idea that popped up in the middle of biology class. Looks that way to me, very cool. Just give him a katana to match the name and he'll look even better (in reference to the FFX aeon, Yojimbo). Are you sure the reading is just like you said? There are two types of reading ... In names, the short one is used (it's called "On-reading" and "kun-reading"). For example, normally the sign "mitsu" from "Yoshimitsu", as a single sign, is read "hikari". I think "Hebi" is read as "Hebi" only if the sign is individual. Hope I'm clear.